Today customers look to engage with organizations through an increasing number of channels – and expect more from every customer service and support experience. As a result, connecting customers quickly and efficiently with the information they need has become doubly important: both as a means to reduce service costs in a harsh economic climate, and as a key battleground in the drive to establish competitive differentiation and edge. 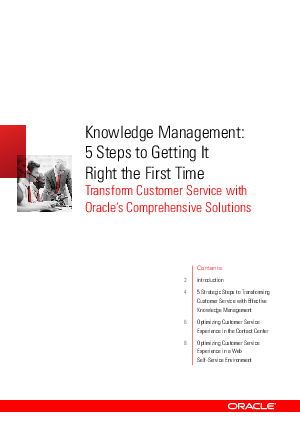 But while a carefully implemented knowledge management initiative can transform customer service experiences and organizational efficiency, a poorly implemented initiative can have a negative impact – increasing call and Web session time and frustrating both customers and agents alike.